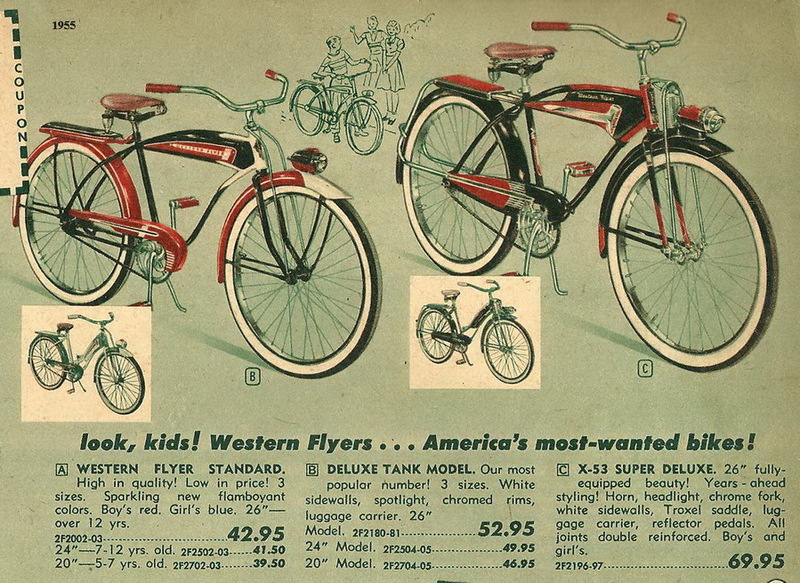 The Western Flyer X-53 Super was the top of the line bicycle sold through the Western Auto store chain which does not exist today. This bicycle was built by Murray Ohio Mfg. Co. for Western Auto from 1953 to 1958 It was built according to exclusive Western Auto designs. Most likely, many components on the bike were styled by Murray-Ohio’s chief bicycle designer Viktor Schreckengost, a famous industrial designer and artist. The bike featured the usual gadgets (electric horn, headlight, etc.) Murray hydrogen-brazed the seamless-steel tubing. Chrome abounded on the fenders, tank, chainguard, rear reflector housing, and headlight. It came with chrome triple-action shock absorbers for a smoother ride. 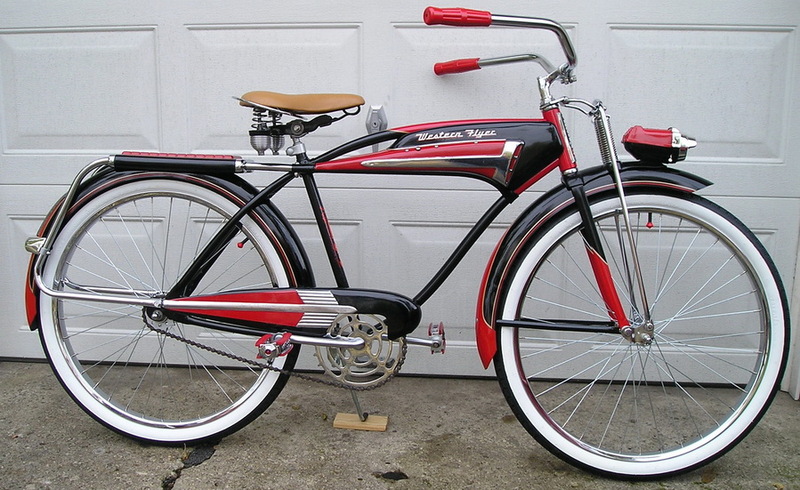 The skip-tooth chain and sprocket (1” pitch) were used on the ’53 – ’55 bicycles. The ’56 – ’58s had the 1/2 inch pitch chain. The fenders were painted for the first year or two. 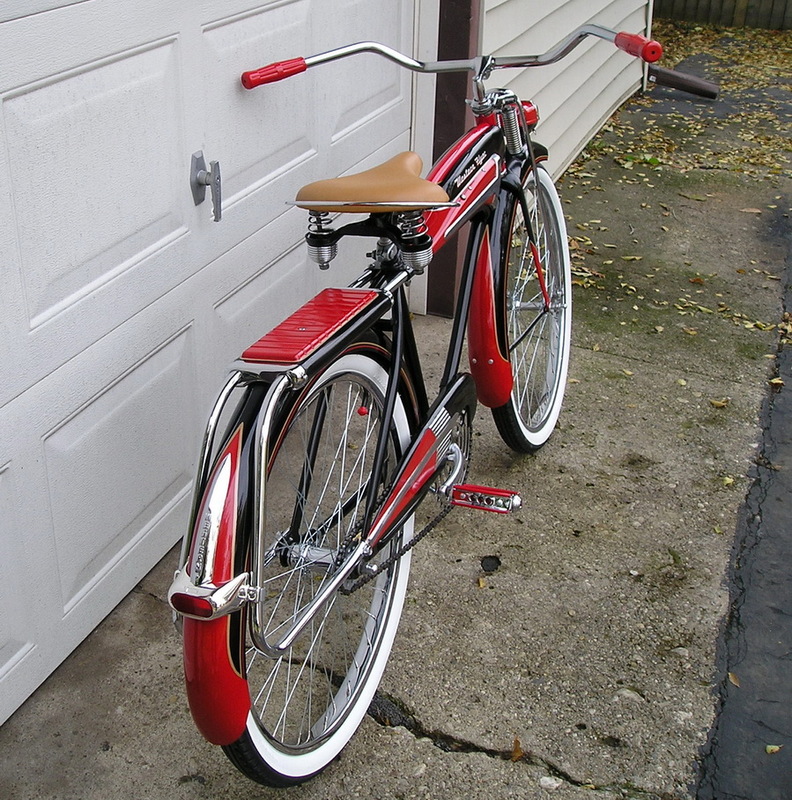 From ’55 and up, the bikes had chrome fenders. 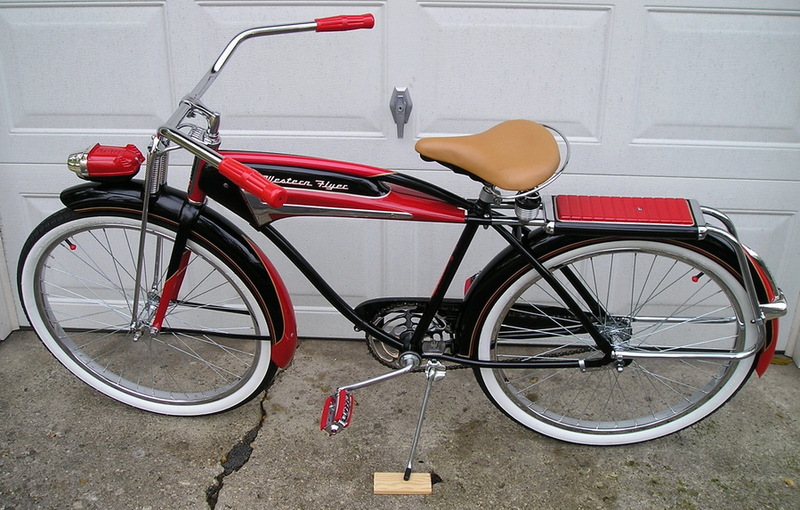 The 1953-54’s and early 1955’s (like the X-53 pictured) sported a black and red paint scheme (boy’s version) or two-tone blue for the girl’s. Only a boy’s model was offered after 1955. These and the ’56 models wore a flamboyant, black cherry and gold, or red and gold paint job. 1957 -’58 models were painted rich black and gold. Price New at $69.95. 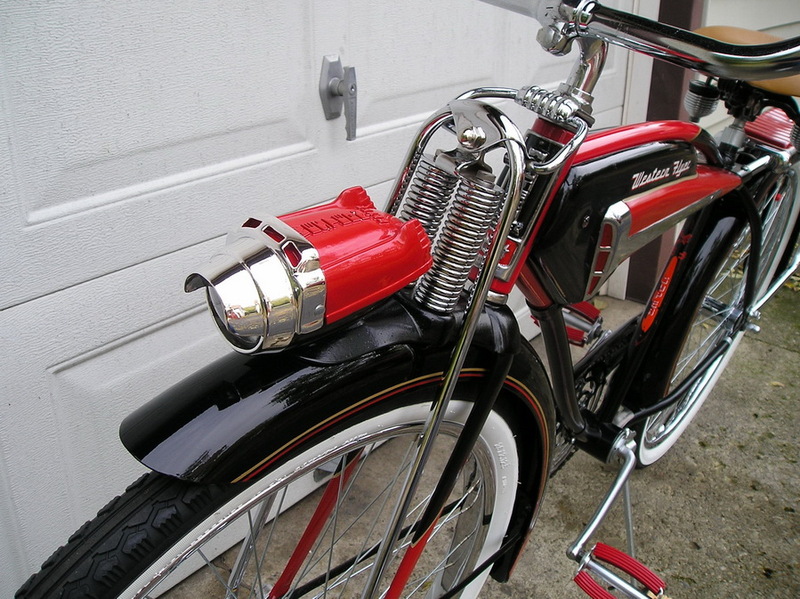 The headlight: Delta Rocket Ray (bottom) with a special top designed by Viktor Schreckengost that he made to look like a 1950’s Cadillac.The Rear Hub: Early bikes used the Musselman; later ones Bendix. The Pedals: Special Western Flyer “bow-type” with Jewel Reflectors. 1957 -58 bikes used standard Wald pedals. Tires: Davis Deluxe 26 x 2.125 whitewalls. Saddle: Troxel Deluxe with leather cover. This bike was a real challenge to restore. The only reproduction items on the bike are the handlebar grips (not 100% but close) the headlight top, and the tires. Since these pictures were taken, a better “X-53 Super” decal was put on.